The Scholar is a publication of the Graduate Schools of Education and Psychology at Assumption University of Thailand. Aim: The journal aims to collect the intellectual and scholarly contributions of researchers as well as to inform, update, enhance and guide the real practices in the field of education and psychology. Scope: The journal focused on researches and academic articles from a variety of backgrounds in the field of education and psychology from within the South East Asian region and beyond. The editor, the editorial board, or any of the authors of the material contained herein, may be contacted for further information at the e-mails provided on the back cover page. The journal will be published twice a year, in June and December. 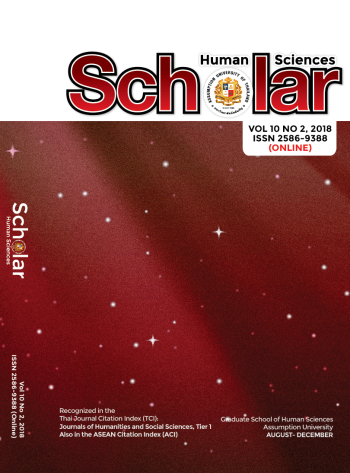 The Scholar has been recognized in the Thailand Citation Index (TCI) under Journal of Humanities and Social Sciences in Tier 1 since 2015, it has also been approved by the ASEAN Citation Index (ACI). Due to this honorable position the demand to publish articles in this journal has increased. Therefore, the Scholar is now publishing twenty eight articles in each issue. You may also observe the QR code on the back cover page of the journal, providing the facility to view the articles online. Thai-Journal Citation Index Centre (TCI) just finished its third round of evaluation and made an online announcement on May 31, 2015. Scholar Journal successfully passed the TCI's 3rd round of evaluation and is now place in tier 1, valid until December 31, 2019.